Weibo has changed the world for Chinese netizens. As a top social network in China (the name literally means “Microblog”), Sina Weibo, known as the Chinese Twitter, affects Chinese people’s experience of political events, current events and interactions with celebrities. Since Sina Weibo has a simple and user-friendly interface, it’s widely used by both the younger generation and less-experienced internet users. This popularity is a very remarkable achievement because it’s not always easy to get China’s older generation involved in online tools like social media. Instead of browsing around different websites looking for cool stuff, Weibo brings the coolest things to you. Sina Weibo recommends the most popular groups and celebrity users every day, as well as highlighting the Top 10 Weibo discussions. In contrast to RenRen.com, known as the Chinese Facebook for young college students, Sina Weibo enrolls many specialists in different fields to share their opinions. Most of them are willing to interact with their followers. You can get analysis of the latest trends in housing prices from real estate tycoons, stock picks from well-known brokers, and information about new taxes from a former tax officer. With a combination of prominent users and great interactions, Sina Weibo is one of the most important information sources for Chinese people. Sina Weibo also enables entrepreneurs and business people to achieve marketing miracles. Besides sharing latest product information and sending coupons to followers, there are smart ways to make even bigger waves. “Du Fu is busy” is a recent example of a successful promotion on Sina Weibo. Du Fu was one of the greatest poets in ancient China – his image is familiar to generations of Chinese from his appearance on millions of middle school textbooks. A PR firm aiming to promote an exhibition on Du Fu’s 1300th birthday came up with an idea to modernize this Chinese icon: They Photoshopped Du Fu in various funny costumes and modern scenarios like listening to an iPod, vacationing in Hawaii and riding motorcycles. These pictures went instantly viral and have appeared on the Top 10 Weibo discussions for almost 2 weeks. 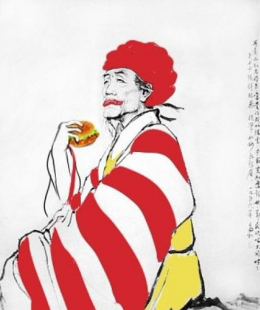 Talented netizens also contributed their own ideas to make Du Fu even busier, like being a warrior in video games and dressing like Ronald McDonald eating a cheeseburger. This event successfully turned an old school cliche into a amazingly funny promotion campaign. “If I don’t view Weibo every day, I lose my connection to the world,” a Sina Weibo user said. Even though the strongest competitor, Tencent Weibo, has developed an ardent following, Sina Weibo is still the king with more than 250 million loyal users. To Chinese people, Sina Weibo is more than just a social network. It’s a network for social innovation, connection and ideas – speeding up the spread of information and pushing Chinese society forward.